As principal of the Penn Cambria Intermediate School, it is my pleasure to welcome you to our school! At Penn Cambria Intermediate School, we have extraordinary teachers and staff who spend countless hours preparing highly engaging activities to promote relevant learning opportunities for our students. At Penn Cambria we truly believe that all students can learn! I am honored to serve as your principal at the Intermediate School. As part of this school community, it is uplifting to know that the parents, community members, teachers, and students all care and support one another for the common goal of receiving the best education. Let’s continue to work together to meet this goal! 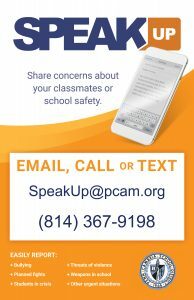 If you have any questions, concerns, or would like to meet, please contact me at (814) 886-8532 or by email- smortojn@pcam.org.